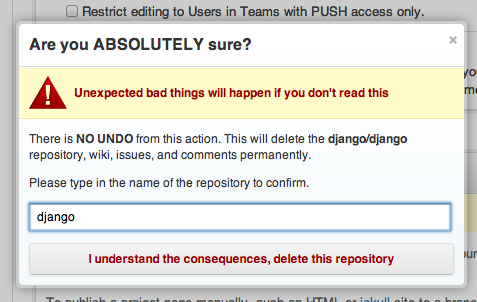 We finally moved Django to GitHub late yesterday. Here's a postmortem, to keep the community updated and for the benefit of any projects that take this leap in the future. The difficulty of branching. We used tools like svnmerge to keep track of which parts of branches had been updated from trunk, and some of us on the core team used Git/Mercurial on top of Subversion, but this was all unnecessarily complicated -- to the point of being stifling. Lack of decentralization. When I would hack on Django on an airplane, for example, I couldn't make a bunch of commits locally, then push all of those to the master repository; I'd have to put everything in a single commit. With Subversion, it's all or nothing -- you push everything to a centralized server as you do it (or you use a branch, but that's painful, as noted above). Slowness. After you use Git for a while, Subversion feels sluggish. This is due to a bunch of design and implementation differences. Aside from that, we had set up a GitHub mirror (now called django-old) a few years ago, and lots of people were getting code and forking it there anyway. Why Git/GitHub, as opposed to Mercurial/Bitbucket or some other system? Because it's very well-made, and it's where the people are. Clearly GitHub has won the majority of open-source developers' mindshare. John Lennon said: "If I'd lived in Roman times, I'd have lived in Rome. Where else?" GitHub is Rome. The first thing we considered was to simply start using our existing GitHub mirror -- turn off the Subversion stuff and start committing there directly. But the problem there was that we'd never set up an authors file. Basically, an authors file maps Subversion committer names to standard names and email addresses, so that GitHub knows that a commit by "adrian" in Subversion maps to the adrianholovaty GitHub account. With that mapping established, you get niceties like GitHub commits linking to appropriate GitHub user pages and displaying proper user avatar images. More importantly, it gives all of our contributors proper credit within the GitHub ecosystem for the full history of their work on Django -- which has value these days, considering companies are looking at GitHub involvement for job applicants, etc. So the first step was creating that authors file, which Brian Rosner organized, with the help of several other people. We ended up accounting for every one of the 58 people who have ever committed to Django, except for somebody named "cell" who was given temporary commit access during a sprint six years ago. 1. Copied the Subversion repository from code.djangoproject.com to my laptop, to make the migration faster. On my first run of git-svn, I ran it from my laptop and pointed it at code.djangoproject.com, and it took 3.5 hours! After I copied the repo to my laptop and tried it again, it took a little over an hour. But the caveat here is that I also changed the git-svn command between those two runs, so I'm not sure how much of the speed improvement was because of the local SVN repo. 2. Ran git-svn (with the correct arguments!). This took a little over an hour, and it created a Git repository called django-dry-run. Note that authors.txt is the authors file, as explained above. The trickiest thing about this was determining the correct arguments to use -- specifically, whether to use --branches explicitly or --stdlayout. As you can see, I ended up using neither. But as we discussed this over IRC, we decided it wasn't worth the effort, we could always do it later and git-svn wouldn't actually do it the way we wanted. Ideally, I'd like these branches' histories to be migrated such that they're treated like merged branches in Git -- a merge commit that knows the individual commits on the branch. If you know how to pull this off, and it can be done without altering the Git hashes, please let me know. 3. Changed git-svn-id to point at code.djangoproject.com instead of my laptop. git-svn adds a "git-svn-id" section to each commit message in the resulting Git repository. It includes a URL pointing to the commit in the original Subversion repository, which is very useful. But, because I did the import from a local repository, the git-svn-id's were all pointing at my laptop. So I ran git filter-branch to clean it up. 4. Renamed old GitHub django repository to django-old. Originally we'd talked about deleting the repository outright, but that would have deleted all pull requests and likely would have broken some other things. So I just renamed it to django-old. Not sure how long we'll keep this around. 4. Imported the new repository into GitHub. Final number of commits in our Subversion repository: 17,942. Number of forks of the old (mirror) GitHub repository, as of this writing: 783. The old Subversion repository will remain indefinitely, for the benefit of scripts out there that do automatic updates, and general stability of the Django world. There won't be any more commits there, obviously. If we ever need to dive into the history of one of the big merged branches -- such as magic-removal -- we can do so in the Subversion history. Or we can consider copying the branch history into Git somehow (see above). I'd like us to provide some documentation on how to convert your previous Django fork (from the django-old repository) to track the new repository. Any volunteers? We still have a bunch of work to do fixing places in our documentation and code.djangoproject.com that refer to Subversion. Bear with us. GitHub's ticket system is a bit too simple for our needs, given the Django triage process, so we're sticking with our Trac installation, at least for the time being. But, of course, we want to take advantage of GitHub pull requests at the same time. So we'll need to figure out the right balance between pull requests and Trac tickets, such that we maintain our sanity, we don't make people jump through hoops, and we optimize for contributor and committer productivity. Personally, I want to avoid a situation (and culture) where we force contributors to use Trac if they post pull requests, especially ones that contain trivial changes. But at the same time, it'll likely become a maintenance nightmare if we have lots of tickets in two places, with no coordination. So, this is an open issue we'll be working to figure out. Jacob has been working on a technological solution. Thanks to all the people who helped with this transition, and I look forward to the much happier development and collaboration experiences we get with GitHub. The commits and pull requests I've already handled have been a pleasure. Thanks for the write up Adrian! It's nice to hear the details of why certain decisions were made. I appreciate your - and the Django community as a whole - openness and transparency. Hopefully the process of getting all the kinks worked out goes smoothly. Thanks Adrian. I echo Dana's statement. We appreciate the work of you and others in the django community. That is pretty interesting. I do like git and github. I wonder how well it will work for such a large scale project like Django. Good luck. Nice. Subversion community mourns the loss :3 but the decision clearly was right. Now that it became way easier to fork and pull-request, I'd guess there will be more incoming patches, too.